When we talk about exercise equipment, we are typically referring to fitness aids for adults, but these days, manufacturers are beginning to recognise a whole new market - kids. A few generations ago, children met their need for exercise by walking, running, swimming, and riding bikes. Active play, usually outdoors, was a normal part of most every child's daily life, but today's kids often spend a great deal of time indoors - and much of that time is spent pursuing sedentary pastimes. Modern parents are understandably exasperated. Their children are more likely than any generation on the past to be overweight, often to the degree of obesity, and many parents are at a loss to motivate their children to be more active. Watching television and playing video games are two favourite activities, but when overindulged, such interests can have unhealthy consequences. Parents should encourage their kids to get involved in sports, whether individually or in teams, but for those kids who shy away from the notion of athletics, parents may want to consider purchasing a few pieces of specialised exercise equipment sized just for their children. Adults often strive to fit regular workouts into their daily routines by joining health clubs or buying home exercise equipment, but until recently, kids didn't have these options. Now, however, a number of companies make scaled down versions of treadmills, stationary bikes, elliptical trainers, and other exercise equipment for kids. Fitness-minded parents can equip their home gyms to include exercise machines designed just for their kids. Cardio training equipment such as stair steppers, ski machines, moonwalkers and rowing machines are all readily available, and strength training equipment is available too, allowing kids to get well rounded workouts at home. While some kids may utilise home exercise equipment to meet all of their fitness goals, others may benefit from using exercise machines to help them to get into shape for specific sports, boosting their competitive edge. 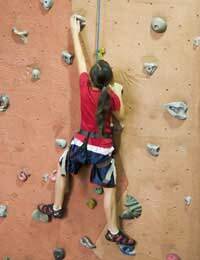 Climbing walls can improve coordination, strength, and agility - important components to overall fitness as well as helpful in many individual and team sports. Strength training equipment can be used to build muscle, isolating specific muscle groups for optimal performance on the athletic field, and cardio training is vital for health, weight control, and endurance, and many fitness experts would classify cardio as the single most important type of exercise. Kids who are involved in organised sports may want to consult with their coaches for help in formulating workout plans specifically for them, with recommendations for safe and effective use of exercise equipment. In an ideal world, kids would get all of the exercise they need through active play and participation in both team and individual sports. Unfortunately, many kids fall far short of this ideal and find themselves overweight and unhealthy. Childhood obesity is fast becoming a major health concern and medical professionals agree that obese children are at increased risk of developing diabetes, heart disease, and even some forms of cancer. Additionally, overweight kids are likely to become overweight adults, further increasing their chances of falling ill. Purchasing exercise equipment for kids can help get them on the right track early, setting them up to life-long exercisers.